Reared, playing until the end of this week at Theatre503, contains a degree of novelty. This novelty stems from one or two surprising, if not entirely unpredictable, plot twists. Unfortunately, these plot twists are not quite enough to propel the play beyond providing a mildly entertaining evening of theatre. John Fitzpatrick is clearly a talented writer; the play is sharply observed and there are moments of real humour. Yet, the evening lags somewhat. I am not sure whether this is to do with director Sarah Davey-Hull’s pacing or whether the production’s faults rest with the script. 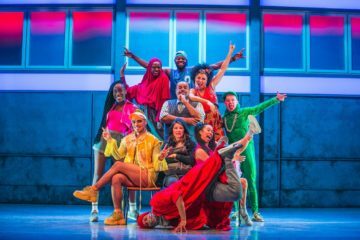 What is clear, though, is that the play constantly shifts between farcical humour and deep sadness — with varying degrees of success. Fitzpatrick portrays a family of three generations living in a house that’s bursting at the seams. Eileen (Shelley Atkinson) and her husband, Stuart (Daniel Crossley), are a somewhat happily married couple. However, there is a problem: Stuart’s mother Nora (Paddy Glynn) is showing signs of dementia. Stuart fails to acknowledge this and the onus is placed on Eileen to take care of her. Not only that, but Stuart and Eileen’s daughter, Caitlin (Danielle Phillips), announces that she is pregnant. She is only 15 and refuses to name the father, which further worries her parents. Money is tight and their place is small. Eileen feels unable to cope as the main carer of her mother-in-law Nora. She suggests moving Nora into a space in the garden, or into a care home. The dramatic tension centres on their squabbles: who will compromise, and how far away is Eileen from breaking point? The aim of producing company bold & saucy, a female-led theatre company, is to put women at the centre of storytelling. They certainly succeed in this: Reared has a female-heavy cast who realistically portray their characters in their strengths and weaknesses while steering clear of stereotypes. Throughout the play, it is made very clear that caring, nurturing and general domestic tasks are often left to women. There is no real reason that Eileen should be forced to take care of Stuart’s mother. The unfairness of this, and Stuart’s inability to simply ‘get it’ form one of the most interesting aspects of the play. Shelley Atkinson does a fantastic job of negotiating the complexity of her character. She is tasked with veering between a very emotionally vulnerable state and acting as a pillar of strength; the responsibility lies on her to prevent the family from collapsing in on itself. She is not an ‘ideal’ woman and nor should she be. She is portrayed as someone who is simply attempting to do her best under extremely trying circumstances. And take my milk for gall”. Daniel Crossley is believable as the distracted, procrastinating father. Does he really not see what’s in front of him, or does he choose to ignore it? Paddy Glynn is also wonderful at flitting between clarity of expression and utter confusion. 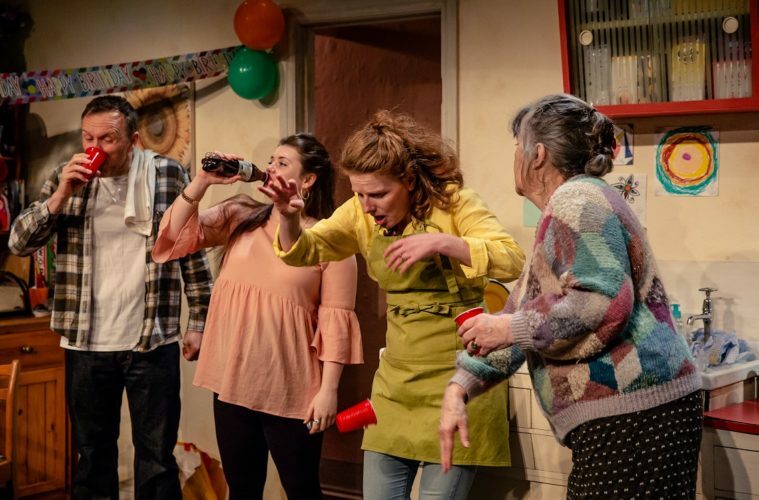 Sammy Dowson’s stage design shows a crammed, messy and homely kitchen, which is completely convincing as a household setting. The intimacy of the small venue works on two levels: it adds a sense of closeness and intimacy with the characters, but also a feeling of claustrophobia, signifying potential imminent disaster. The directing could be more inventive. For example, the flashbacks are often too literally indicated with an abrupt shift in music or lighting. The shifts between farce and melodrama are not always carefully negotiated and some cutting or editing of needless backstories would have streamlined the narrative. Overall though, it is a difficult script to deliver and Davey-Hull successfully builds tension throughout. It’s a real shame that it loses its way a bit — in particular, the ending feels like something of a cop-out. Nonetheless, Davey-Hull produces a number of memorable and touching moments. A standout scene is an amusing and well-delivered anecdote from Nora about her past in Ireland and a boy who survived the potato famine. 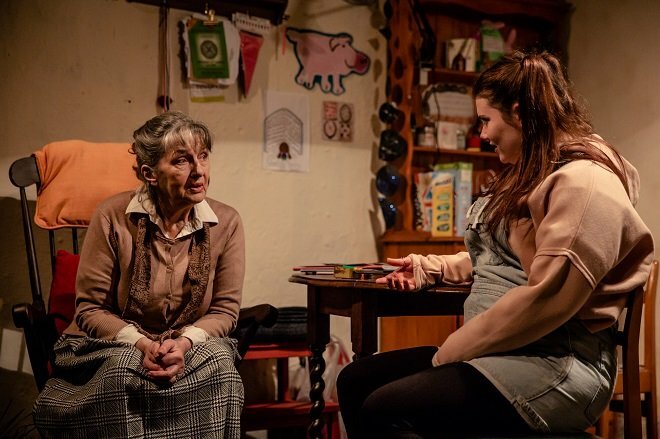 As well as this, Eileen and Caitlin have a number of moving conversations and it is refreshing to see mother-daughter relationships — which are underrepresented in culture — depicted with such nuance and realism. Ultimately, it’s a pity that the main sense of shock and excitement in Reared comes only from one or two small plot twists. The actors work hard, however, and they manage to imbue the script with the requisite energy to make it a worthwhile evening. Reared is funny, sweet and sad. Promising, yes, but not quite excellent. Image one shows four people standing in a row in a kitchen. The two on the left are taking a drink – one out of a plastic red cup and the other from a coke bottle. However, the woman on the far right has just knocked the cup out of the hands of the woman on the second right. The cup can still be seen falling to the floor. Image two shows two women sitting down and talking to each other. The woman on the left is older; she has grey hair and her hands and clasped in front of her. The woman on the right is younger; she has her hair in pigtails and is wearing short dungarees. They are sitting in quite a messy room – there’s an assortment of pictures on the wall and a lot of clutter on the shelves behind them.